LAC-MEGANTIC, QUE. – Pausing briefly, Mélanie Quirion, secretary at Kia-Mégantic, composes herself before continuing. “It’s a small town. Everyone lost some very close friends,” she said when asked about the disaster. Lac-Mégantic, a sleepy little town in south western Quebec, became the site of one of the worst train derailments and toxic spills in Canadian history. As many as 47 people died when a train owned by Montreal Maine & Atlantic Railway broke loose and bolted unmanned down the track before derailing in the early morning hours of July 6. 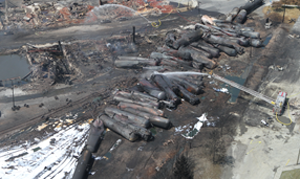 Train cars toppled over spilling as much as 5.6-million litres of light crude oil. The sludge ignited causing a massive explosion that decimated nearby buildings and spread fire throughout a six block radius of the small downtown core. 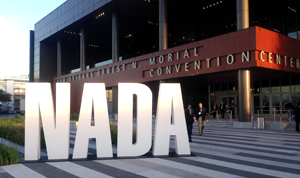 Situated outside of that damage zone are two franchise car dealerships – Kia Mégantic and Mégantic Mazda – that serve the community of about 6,000. And while neither store lost a staff member in the carnage, the weary tone in Quirion’s voice signalled that tragedy was not too far removed. She said that Mégantic Mazda’s service manager lost his daughter in the explosion. Serge Rosa, owner of Mégantic Mazda said his brother, Yvon, owner of Kia Mégantic, was nearly caught in the disaster, too. Rosa said Yvon had been at a popular bar downtown called the Musi-Café when the train derailed. Yvon only avoided serious injury thanks to what he characterized as miraculous good fortune. The Musi-Café was the scene of most of the 47 deaths that night. Yvon was leaving the bar and had just crossed the street when the train derailed. Rosa said his brother ran and found shelter behind another building before the explosions started. The explosion was followed by two sleepless nights while the chaos and fear subsided, he said. On the first night, people were trying desperately to call each other and there were fears that further explosions might follow. The second night was defined by chaos as well, but by a different kind of fear: fear for the missing. As hard as it was to return to business, he said things have started to turn around slowly. Supply has not been affected and neither store suffered any damage to inventory or facilities. He explained that business was understandably bad for about a week and a half. After surviving an explosion that rocked the whole town, people’s minds do not rush immediately to buying a new car. To add to that, he said a lot of people lost their jobs. Reports indicate as many as 115 business were located inside the Red Zone. The Musi-Café has announced plans to rebuild, which is being celebrated as a sign of the town’s resilience. And while car sales are on the rise, the big question now remains what will happen to the downtown area and will those businesses return following the cleanup? Cleanup costs have been pegged as high as $8 million.Manufacturers have stepped in to help the town with Kia raising nearly $30,000 and Mazda noting it has similar plans. 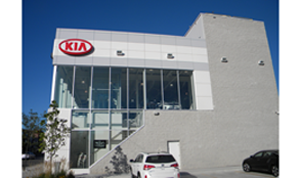 Kia also sent extra cars to the dealership following the disaster to make sure it would be well stocked. Rosa, whose weary voice belies the work involved in recovering from a tragedy like this, sounded relieved that sales were up towards the end of July. He stopped short of sounding optimistic.